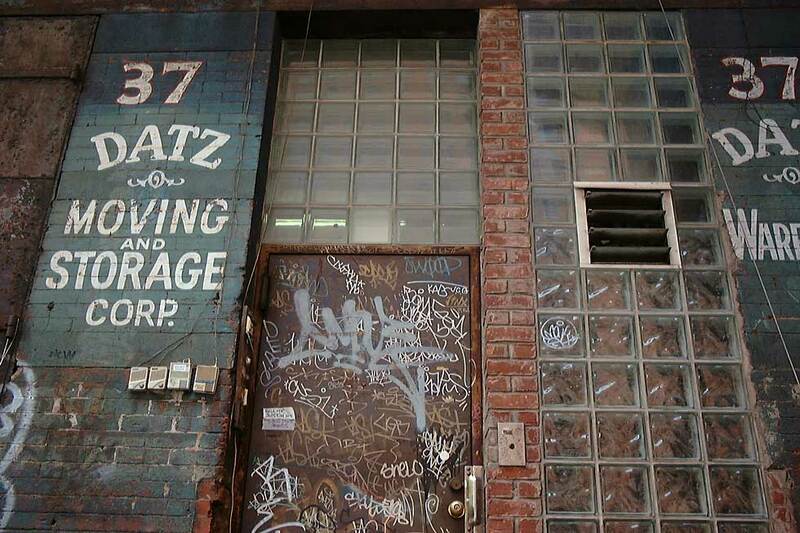 Datz Moving and Storage was located at 37 Vestry St., New York City, from 1969 to 1974. The New York City Landmarks Commission report, Tribeca North Historic District Designation Report, December, 1992, has the following on 37 Vestry St., "37 Vestry Street; Tax map block/lot 219/16; date 1882-83 [NB 1269-1882]; architect: George W. DaCunha; Owner William Menck; Type Warehouse; Style Commercial derived from German Rundbogenstil; masonry load bearing walls; 6 stories ... William and Charles Menck were in the storage business, located in 1840 at 395-397 Greenwich Street, a building erected by Henry J. Meyer (in what is now the Tribeca West Historic District); after constructing this warehouse in 1882, William Menck purchased the adjacent one at 39 Vestry Street. The storage firm of Baker & Williams, which owned other warehouses on the block, later used this building as well. During the 1920s it was leased along with No. 39, by the Weinberg & Posner Engineering Company, the Russian-American Warehouse & Shipping Company, Inc., and the Marbaud Corporation. In 1937 the building was joined internally with 35 Vestry by the J. Cane & Sons baker's supply firm for use as a storage warehouse. During the 1960s Nat Brown's Export Packers and Warehousing business was in the building. There are remnants of the painted signage of 'Regina Products,' '__ & Schueller, Trucking Corp.,' and 'Datz Moving and Storage Corp. Warehouse' on the facade."